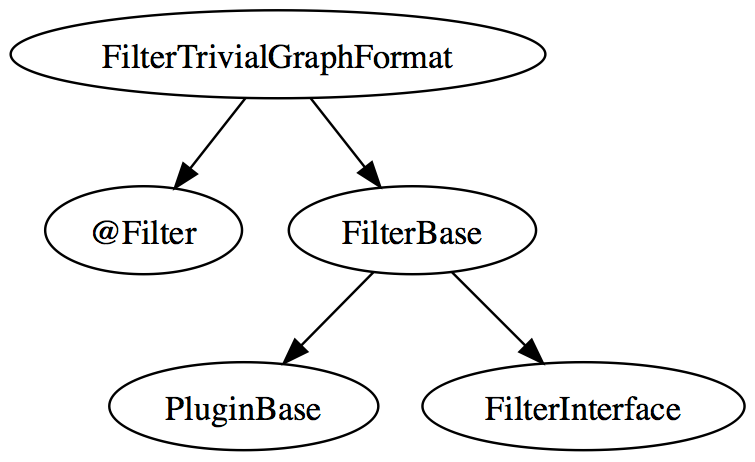 For Graph API the Trivial Graph Format submodule introduced into 7.x-1.x needed an upgrade to Drupal 8 lingo. My initial thought was to upgrade the sub module to discover hook_filter_info was gone. Checking the filter.api.php there is more gone then kept. Once you know it's a plugin it is almost trivial apart from the annotated part. Thanks to almaudoh's remark I learned we have an enforced directory tree. Plugins belong to the Plugin and filter plugins in the Filter so the full path is now lib/Drupal/graphapi/Plugin/Filter. Let's make a copy of the core/modules/filter/lib/Drupal/filter/Plugin/Filter/FilterHtml.php and we have lib/Drupal/graphapi/Plugin/Filter/FilterTrivialGraphFormat.php ... almost that is as we need proper annotations. * Provides a filter for rendering Trivial Graph Format. This class documentation is trying to tell the discovery mechanism build into Drupal 8 to use the @Filter as it's annotation template. Reading that files documentation explains the existence of all attributes as seen above apart from type. Type is documented in FilterInterface. But what do these mean? And why are it's values documented that weird? FILTER_TYPE_MARKUP_LANGUAGE: The filter converts something that's not HTML to HTML in a way that is not compatible with WYSIWYG editing. FILTER_TYPE_HTML_RESTRICTOR: The filter restricts the HTML allowed, for example, to protect against XSS. FILTER_TYPE_TRANSFORM_IRREVERSIBLE: The filter performs a transform for which a WYSIWYG plugin does not exist to perform the transformation client-side (especially, the reverse of it); instead, the WYSIWYG editor displays the unfiltered text. For example, Token Filter. Finally it's SVG is copied into this blog. A shorter version would without the links looks way shorter and easier to learn.